It’s October finally, and there’s something to the brisk air, change in colors, and taste of human flesh pumpkin spice that just feels right to me. And if you’re a particular brand of weirdo (like me), October means you get to watch or read as much horror as you’d like without feeling guilty about it. I find it interesting that I’m writing this post only a couple blocks away from the home (in Providence, RI) of the creator of Cthulu: H.P. Lovecraft. I owe him a great deal of respect for influencing some of my all time favorite horror authors and for much of the premise of this post. He and several other authors have shown me that horror can serve a purpose by expressing truth to an audience that has a hard time seeing it. To give you some of his background, in Lovecraft’s worldview we exist in a materialistic universe, and we are thus meaningless and insignificant in the grand scheme of things, and his stories typically convey those beliefs pretty well. His stories, typically consist of some character(s) stumbling upon the existence of an increasingly more powerful, intelligent, and malevolent creature than man. And when his characters become aware of these creatures, they are often driven to insanity. The recognition of these other “gods” drives these human characters insane because it would seem to prove that humans are essentially nothing in comparison to a creature that could (and will) simply wipe out humanity in the flick of its wrist. In Lovecraft’s mind, humans are simply a product of a chaotic universe, and he rightly shows that the implications of that are a horror in and of themselves. His worldview bleeds into these “cosmic-horror” stories, and although I profoundly disagree with his worldview, he does something incredibly well with the horror genre which I think modern horror-authors have typically failed to do. Essentially, Lovecraft uses terror to present what he believes to be true. I’m not just deducing this either. 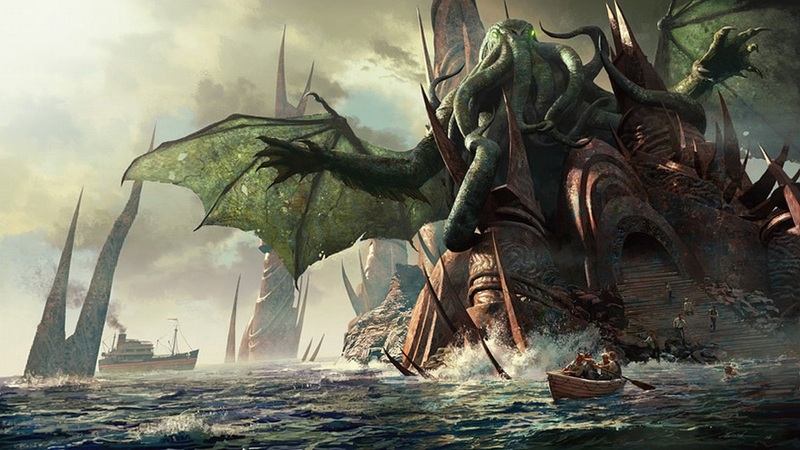 Listen to him, “Now all my tales are based on the fundamental premise that common human laws and interests and emotions have no validity or significance in the vast cosmos-at-large.” Lovecraft struck gold in presenting his worldview through the means of horror. Consider this approach to horror in contrast with the modern horror trend of simply desiring the audience to be startled or grossed out for the sake of being startled or grossed out. And he’s not the only one who’s done this with the genre. Another notable (although she’d never want to be described this way) horror writer was Flannery O’Connor. O’Connor was known for her disturbingly subversive stories and grotesque characters. She also was a Roman Catholic who once said about her own writing, “All my stories are about the action of grace on a character who is not very willing to support it, but most people think of these stories as hard, hopeless and brutal.” Speaking of remarkable utilizers of horror… O’Connor may very well be one of the best. I believe this to be horror at its finest. To a culture that is hard of hearing, nearly blind, and content with distraction, truth must often be expressed in an unsettling manner for it to sink in. This is not at all to say that every horror story is truth-telling nor is it to say that everyone should watch horror. As I said before, much of modern horror likes to draw the “large and startling figures” but for no other reason than feeding off a particular audience that simply wants to see the “large and startling figures.” But to those who are intrigued to partake, I want to at least suggest a good place to start among modern horror. Of recently, The Babadook by Jennifer Kent has stolen my attention. Not only is it truly scary, but it’s well acted, well produced, and well written. It’s a quality film all-around. But that’s not quite why it stood out to me among other horror films. Why I loved it so much is because of how it helped me see into the life of another and helped me understand myself in a way that I probably could not have through any other genre of film. And I won’t give away much detail, but the book is not a pleasant book. It’s a book that opens up a whole new kind of grief, a whole new kind of despair, a whole new kind of nagging oppression. The book opens up to the readers an unpleasant visitor known as… the Babadook. And the Babadook isn’t your typical horror monster. He’s far more terrifying. He doesn’t just appear at night. He doesn’t just show up in the haunted house. He’s everywhere and encountered even with just the thought of him. And even after the disposal of the book, the book soon reappears with words claiming that things will only get worse with further denial of the creature’s existence. Worst of all, there’s an insistence that you can’t get rid of him. He’s there to stay. Yet again, horror demonstrating something that no other genre probably can. These types of horror stories may be hard to come by, but I assure you, there’s goodness to be found in this genre… though that goodness may be unsettling and may urge you to leave the lights on.